Ever year, I like to give gifts that are a little more personal, and I have found that using some of the many photos I take each year is a great way of doing it. The recipients (especially Grandparents!) love the gifts as they are so thoughtful, and I like the idea of my images not just sitting on my computer but out where they can be enjoyed. There are also different price points here - some you can make yourself, and some that are higher end, and some that are more fun gifts, so there should be something for everyone. Here goes! I love the idea of having a custom photo box, with prints inside it. This personalised wooden box from Artifact Uprising is gorgeous. It's a little pricey, but I figure that it would be a gift you could add to each year - so buy the box and a few prints this year, and then next year, add another set of prints to it. (which also saves you having to think about a gift next year too!) I'd give this along with a miniature easel so that they can also display the prints. A cheaper option from Artifact Rising, but just as lovely, is this beautifully simple wood block and photo prints. You can also get something similar from Mpix. This is what I am giving this year, a personalized calendar. I've created my own design using Photoshop, but you can easily buy templates for these in Etsy for just a few dollars, and add in your own photos and print at home. Alternatively, you can buy these ready done (much quicker!) from several places - I like the wall decal ones from Pinhole Press, and the 5x7 prints with wooden clipboard by Artifact Uprising, but really you can get these just about anywhere. Another unusual one is this dry erase calendar from Mpix. I made photo tags in the years when my son couldn’t read, using images of the recipient on their parcel. That way my son could act as “Santa” and hand around the gifts, and I could use photos that would embarrass my sister - win win. 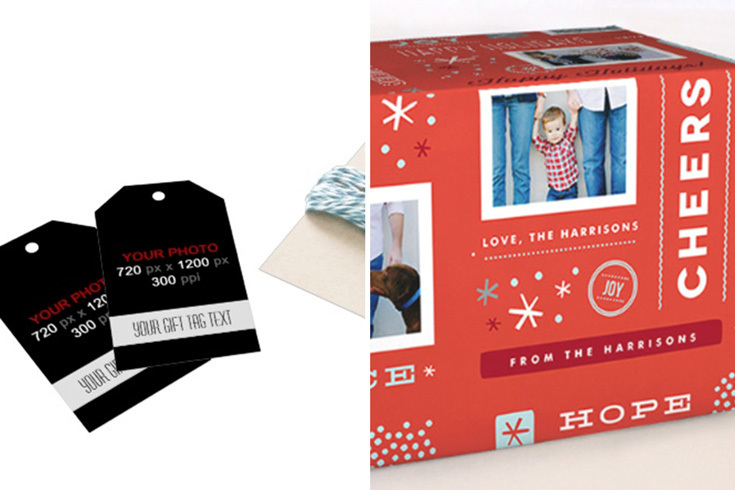 You could also just take photos of Christmassy items, and use these as your gift tags if you preferred. Either way, it's a nice use of your photos! You can easily make your own by printing your images onto card, cutting into shape, then using a single hole punch and some baker's twine (which is what I did) but if you are pushed for time or just not the crafty type, you can buy make these at places like Zazzle. This was my gift last year - a custom photo monthly planner. Mine was actually from Blurb, but they seem to have stopped making these, which is a shame, but I have found these at Pinhole Press that look good. Once again, you can quite easily make this yourself (provided you have Photoshop or Elements, or even Lightroom to an extent) simply grab one of these free storyboard or collage templates, add in your photos, and get them printed at your local printer, either onto photo paper for mounting or framing, or onto canvas. For young children, I love this idea from Pinhole Press for creating your own first board book for younger children, using your own photos. The one here is for names and faces, but you could create one with the letters of the alphabet, or numbers, and so on, each using your own images and therefore personalizing them to your child. You can also make your own photo coasters - here's a link to a tutorial for making your own polariod photo coasters by darkroom and dearly using cheap white tiles, your photos, and a bit of patience! I'm going to be giving these a go in the New Year for sure! This has been on my "must-make" list for around two years now....maybe next year will be the year :) If you have the time and patience to make these (although to be fair, it looks reasonably simple) then these would make a wonderful gift for Grandmas everywhere. You can find the step by step tutorial on how to make these over at Lil Blue Boo. When all is said and done, you can't really beat a custom photo book. I personally have been using Blurb for the past few years for my family photo books, and love them, but of course you can also get these printed at places like Shutterfly and so on. I've never actually held one in the flesh so to speak, but the ones from Artifact Uprising also look pretty darn good for gifts! I know I said 10, but I am adding in one more. Even if you don't like the idea of creating custom photo gifts, then I'm pretty darn sure that just pure and simple prints will go down extremely well. You can get them printed anywhere, and simply tie with some bakers twine or put in a nice kraft box to make them look special. Or you can buy something like these photo strip prints from Social Print Studio which look great, and don't cost the earth. I hope that this post has given you some ideas of what to do with your photos this year!